This gold sparkle deckle-edged A5 card has an image of a purple evening dress matted onto raspberry mirror card, overlaid onto purple glittered damask lace and purple ribbon. 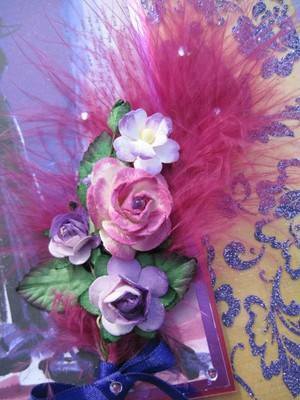 A feather-backed corsage of mulberry paper roses in lilac and raspberry is tied with matching purple ribbon, and pink crystal gems add highlights. A toning banner reads 'To Someone Special'. The paper insert reads 'Wishing You a very Happy Birthday', or choose an alternative below. 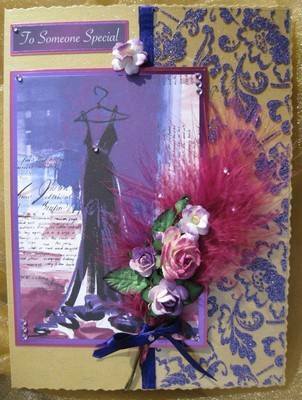 This card comes with its own tissue-lined box with matching ribbon and flowers included in the price.